Today you turned five and time has flown so very fast. It seems like yesterday when the nurse announced “It’s a girl!” and Daddy staggered in surprise. Yesterday that I came home to paint a pale pink room with you by my side in the infant carrier. Just yesterday when our Rose started to bloom. In the past five years, you have blossomed into one of my most favorite people in the world. Your personality reminds me of the salted caramel candy we both love; for the most part sweet, but with just enough sass to turn heads. 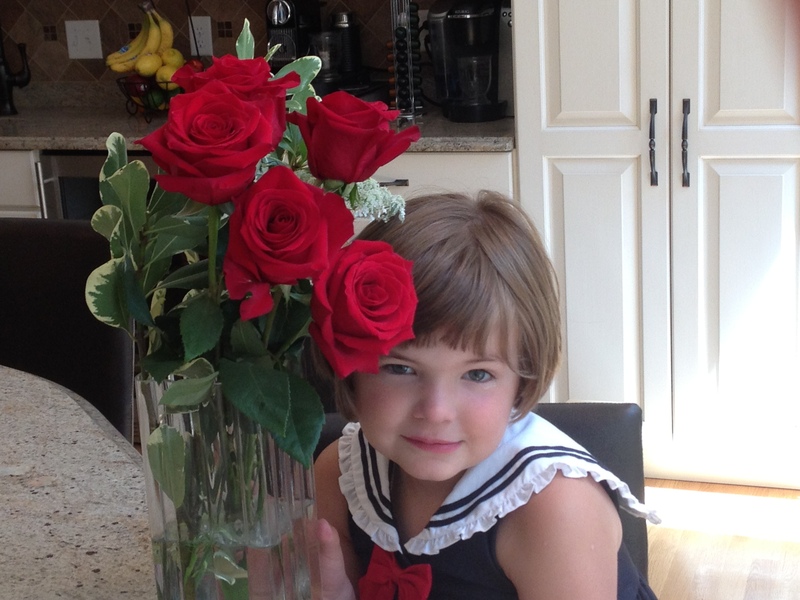 Five roses for five-year old Rose. At the moment you love monkeys; monkey puzzles, monkey books, monkey clothes. You sleep with a stuffed monkey bought long ago for Joey, underneath sheets pattered with monkeys wearing tiaras. A perfect combination. The expression “Daddy’s Girl” doesn’t nearly you justice. Every day, in your deep, raspy voice, you tell us that you want to marry Daddy, how you love him more than me. I don’t mind; I know it’s your five-year old need to forever see our family intact, to keep us all firmly rooted in your childhood. You’ve always been a later sleeper, and these days you’re usually the last in our house to wake. Sleepily you make your way downstairs, hair standing on end, and give each one of us a kiss. “Good mornin’ Mommy!” Feeling your smooth cheek nestle against mine is my favorite part of the morning. You are one part girly-girl and one part tough guy, all wrapped up in a delightfully rosy package. If given a choice, you pick trucks over dolls and plastic guns over princesses. But you want your trucks and guns to be pink. And you love getting your nails done except you usually prefer colors like black or lime-green. You like ketchup on everything. People say you look like me, and sometimes I see my own mother resonating in your quick smile. But already your wispy blonde hair is thickening, darkening, changing. I suspect by the time you’re a teenager you’ll be more Cariello than Watterson. Again, I don’t mind. Because you may be your Daddy’s girl, but you’ll always be my daughter. I look forward to Monday mornings at work when I read Carrie’s posts. Thank you for your beautiful ability to put into words your experiences and love for your children. It reminds me of the love I have for my children and I suspect reminds other moms out there as well. Just loved reading this Carrie!! She is quite a girl and I love that I have the opportunity to get to know her before she heads to school with her brothers!! We love her soo much! You described her perfectly, because she is perfect! Hello! Contact is under tab “Contact Me”, e-mail is carrie@carriecariello.com. Thank you for reading!